Travel brings on a whole new slew of addictions. For example, it wasn't until I arrived in Louisville a few weeks ago that I discovered the lethal Chaiberg. This diddy is churned out by a small local coffee shop just down the street from the hotel I'm living in while I work on this new TV show. 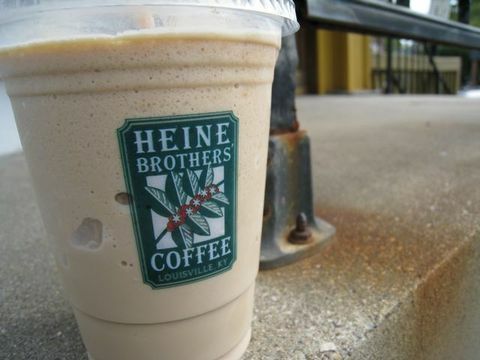 It's like a blended chai tea frappe whipped so fine and crystallized, every single sip breaks my heart. I don't know if I will ever taste anything that good again. Except for the achingly soft upside-down cupcake at the nearby Pie and Ice Cream House. 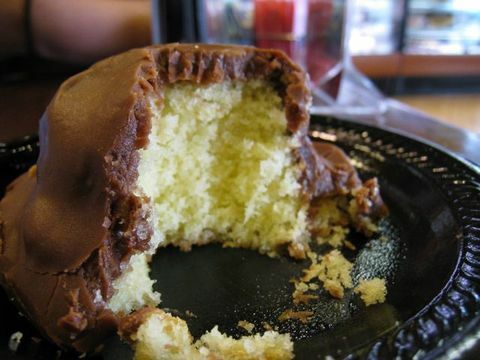 Imagine a buttery, billowy cupcake flipped upside down and dunked all the way down into a huge vat of chocolate. Killer beyond belief. And then there's that amazing vegan restaurant I just discovered this last trip out to Los Angeles. The sparkling-clean Veggie Grill has the most delicious meat imitations I have ever discovered. Crispy fried chicken fingers and a carne asada sandwich that truly put the real deal to shame. Why can't there be something like that in Chicago? Or maybe there is? And, guaranteed whoever busts out the first Chaiberg in Chitown will have some major lines going gangbusters out the door. You'd think that after 30 days of eating nothing but rice in the Indonesian highlands, I'd be a wee bit sick of the little white bullet. Not so. I was no sooner back from a month of Indo bliss (think: volcano trekking, scuba diving and back roads-exploring) than I was jonesing big for rice, rice and more rice. 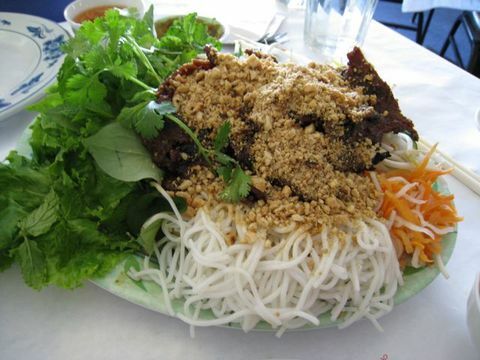 I'd just posted something about Vietnamese food on my foodie/adventure blog, bigsweettooth.com, when a bud of mine laid out some details about his favorite Vietnamese place in the comments section (thanks, Wade!). 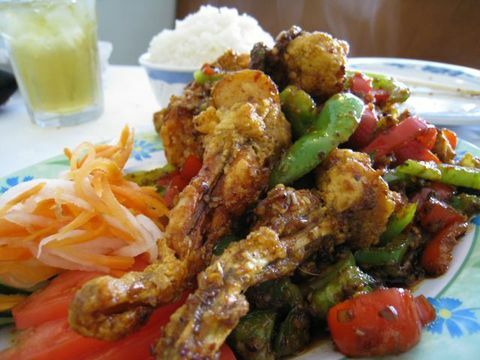 I happily tucked his nugget of intel into my secret bag of goodies and one afternoon, while cruising around Albany Park and craving something exotic, I remembered Hoanh Long. I cut north on Lincoln Avenue; it was game on. Once Lisa, my always-up-for-anything eating crony, and I rolled through the front door with a sack full of Tsing Tao, it was clear we were stepping into something golden. Not because of the decor (specials of the day were taped haphazardly on the wall) and certainly not due to the crowd (there was only one other patron in the place), but simply because the vibe was just downright homey. And, for such a funky stretch of Peterson Avenue, it was a shining star in the tangle of name-brand stores. We instantly felt a sense of calm once we sat down. When I got back from Indonesia last month, I developed a scary addiction to rice and was craving the starch every moment of every day. I'd wake up from a deep slumber salivating about nasi campur (rice with mixed veggies and meat), and I'd go to bed dreaming about rice with sweet long beans and tempeh. My fixation, though, was taken to a whole-new, more-dramatic level when I stopped into Tank Noodle (Pho Xe Tang) on one cold, sunless afternoon. Why, oh why, have I never gone to Tank before? 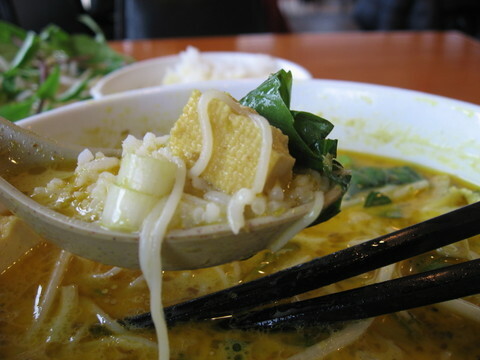 I've always heard great things about it; it's in my neighborhood, and I love Vietnamese food, especially from restaurants that call themselves noodle houses. The place was packed when I scurried in out of the cold. That's always a good sign. And my waiter was all buttered up with excitement since it was my first time in. Another good sign. I loathe when a waiter can't make simple suggestions without pure excitement, and this fella did not disappoint. He ran through the extensive menu like a champ, suggesting dishes that might work for my on-and-off vegetarian palate. After deciding on the curry tofu noodle bowl (bun ca ri tau hu), I rubbernecked the dining room, watching groups of Asians and Americans literally beam with joy while digging into their plates of food. Huge bowls of soup were being slurped down; giant platters of beef came out sizzling; and I was in a pure-white heaven staring at all the steaming bowls of sticky rice being doled out. Even with all the rain pouring down this week, I managed to partake in a plethora of banner meals. Several were so good I went back twice within 36 hours. 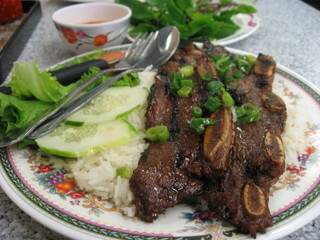 Topping the list of note-worthy dishes are the BBQ ribs I ordered by chance at Pho Hoa, an always-bustling Vietnamese diner in a narrow stripmall in the heart of Uptown. I braved the chaotic parking lot in front so I could hit up a nearby Vietnamese grocery store. 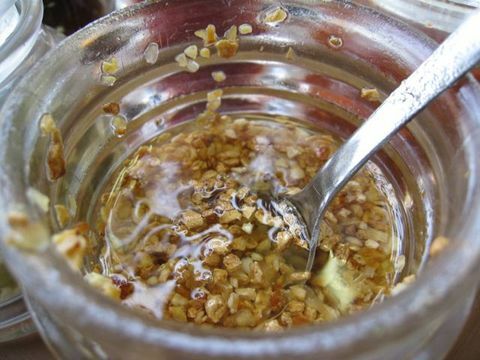 They hawk the prime ingredients (fresh mint and tiny sugar rocks) in my current addiction, delicious Moroccan gunbarrel tea, and I love scouring its aisles for exotic ingredients. After I strolled out of the grocery store, I figured I'd best get some lunch, and Pho Hoa's convenient proximity landed me inside. Once, a few years ago, my intrepid dining pal Lisa and I had a funky batch of pho and vowed never to touch the stuff again. But with the rain and all, I couldn't seem to get it out of my mind: the slurping noodles, heady broth, crisp bean sprouts, fresh lime and butter-soft chunks of meat all floating languidly, just waiting to be divvied up on a giant ceramic spoon and attacked. In a city where every great dish seems to have a gazillion words written about it, Argyle Street is the land of a thousand discoveries. Down every neon-lit block is another snug Thai, Vietnamese or Chinese restaurant, each one claiming to be better the next: Smudged windows display quippy Time Out write-ups, stamps of approval from Check Please, glowing Sun-Times and Tribune reviews or the best, a toothy photo of the Hungry Hound. After taste-testing my way through several of the hit-or-miss restaurants, I think I've found a sure-fire winner. 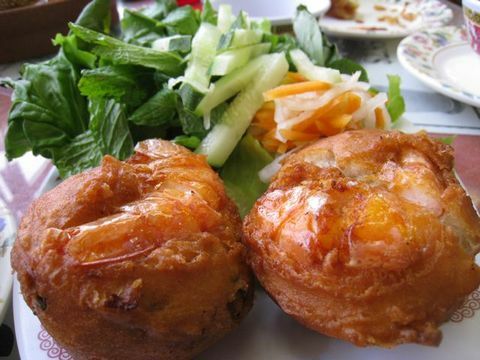 The bites of all bites resides at Hai Yen, 1055 W. Argyle St., a Vietnamese and Chinese combination restaurant that makes every other morsel of Asian food I've ever tossed back seem sub par in comparison. Yeah!!!! This job I have been working on for the past 4 months has wrapped and I can't wait to never really return to the suburbs. Actually, I happened upon some pretty decent food finds out there, but still--I'M NEVER GOING BACK!!! The very first thing that I want to munch on the minute I have a free afternoon is some tasty goi cuon from one of the little shops on Argyle St. 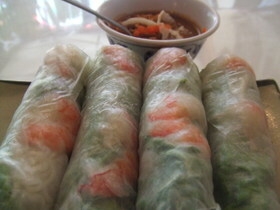 There are some meals that simply haunt me and my Imperial Eggroll entree ($7.95) at Cafe Nhu-Hoa is one of them. For some reason, I cannot get a single speck of it out of my head...maybe it was the freshness of all the trappings that surrounded it? I was stunned to find such crispy and verdant sides hogging the plate...usually in the dead of winter, greens are starting to look a little shabby. 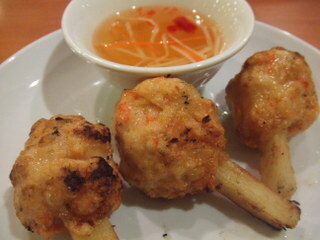 So, you've got the tiny eggrolls--ground shrimp and crab that are just lightly fried. 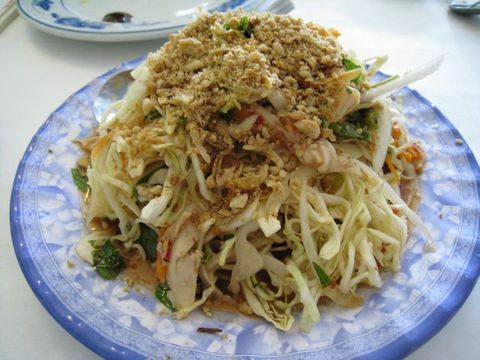 They're packed on a platter with chilled vermicelli noodles, slivered cucumber, grated carrot, poppin' bean sprouts, and handfuls of fresh lettuce, mint and basil. 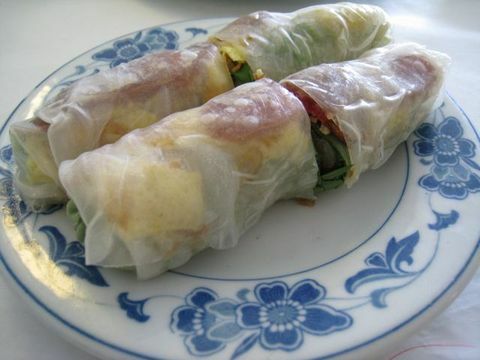 You take each little bit of egg roll and drop it dead center into a big leaf of lettuce and then add a bit of every single garnish on the plate. 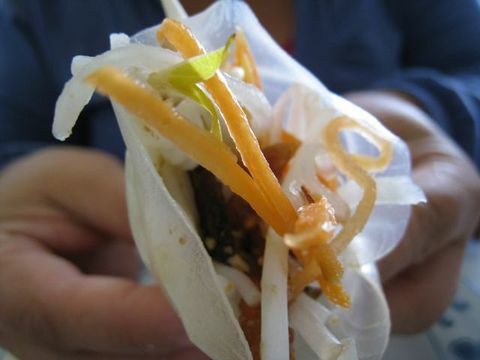 I love to first dip the petite eggroll into a bowl of slightly spicy peanut sauce and then when I have my whole wrap complete, I dunk the whole kit-and-caboodle into a small bowl of nuoc mam (the super delicious fermented fish sauce). This is a dish that will certainly propel me through the rest of winter. 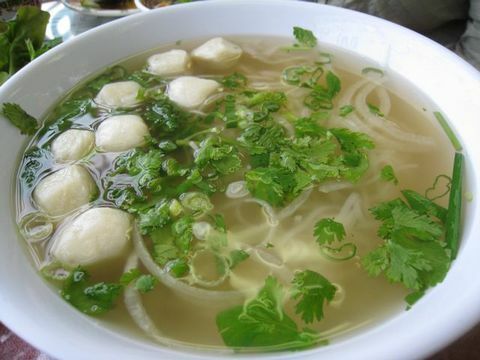 Cafe Nhu-Hoa: 1020 W. Argyle St.